With me, Sam, and Hot Tub crammed into one tiny room, we weren't getting much sleep. So, being the magnanimous person that I am, I opted out of the love triangle. Sam and Hot Tub are doing just fine now. Not surprisingly, I look pretty stupid when other people are recounting their favorite moments from SCBWI. Check it out here and here. 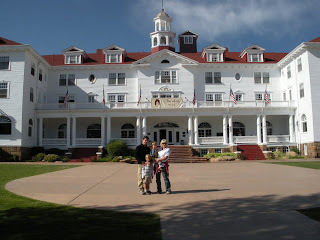 Yesterday we went to the Stanley Hotel, the site where Stephen King was inspired to write The Shining. He stayed in room 217, and thought up one of the creepiest stories of our time. mom: "There once was a man, who stayed in this hotel, and went crazy and killed his entire family. So their ghosts haunt the hotel. Then, there's this writer, who takes his wife and son up to the same hotel to stay during the winter. Well, he goes crazy, typing stupid sentences over and over on a typewriter, confessing to a bartender, who is really a ghost, and stuff. He kills a guy with an axe, and then he tries to kill his wife and son, before he is frozen in the maze. Any questions?" Grandkid: "What the heck is a typewriter?" Anyway, back to the road. 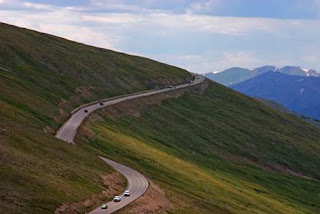 Often, when I have nightmares, I dream about narrow, steep roads. More specifically, I dream about catapulting over the edge and rolling to the bottom of the ravine, and when the car finally stops, it’s nothing more than a twisted piece of metallic wreckage. That’s the kind of road we were on. Why is it that I can love Sam most of the time, but when he gets behind the wheel, I often call upon the fires of Heaven to strike him down, he bugs me so much. So, in Rocky Mountain National Park, Sam is driving, and my fingertips are sweating (because that’s what they do when I’m anticipating death by cliffs) and Sam keeps pointing out the freakin’ wildlife. A couple agonizing moments pass, as the edge looms ominously… uh, nearby. I close my eyes, and simply hope for the best. I glance over to see Sam navigating his iphone with one hand and steering with the other. Sam: “There's no way that's in the bible." So, anyone want to road trip with us? Seriously, we are fun. well i feel the same about kyle when he's driving! SOOOOOOOOOOOOO, lets send kyle and sam in one car and you and i in another! we can even go to two different places! how's that for a road trip????? Dorien- That sounds heavenly. Count me in! its the shinning man....you want to get sued? I hate, hate curvy roads. The drive from here to my husbands family house (up in the mountains of Northern CA) is horrible. I feel sick and crazy the whole time. My hubby does the same thing when we're driving in the canyons around here. Ugh I hate the thinking of the cliffs of insanity (or any road I can fall off of). Way to give it up to the hot tub Bro. Later on when you get home maybe you can have the stove all to yourself. Olivia - I feel your pain. Debbie- have the stove to myself. Ha ha! Keersten- Thanks! I hope my book comes out too. I have a story to tell, but it's too long. Suffice to say, think a couple blindly following a mapquest map combined with a Honda CR-V, a 4x4 single lane road (with NO warnings) that runs along a huge drop off up in the Sierra Mountains of California and the teenage good Samaritans with their "crawler" vehicles that pulled them out.